Missile-defense skeptics yearning for a fresh look at the wisdom of pumping $10 billion annually into missile defense aren't going to get it from Barack Obama when he moves into the Oval Office. The Russians  along with the two men most likely to end up running the Pentagon for the President-elect  have already made sure of that. It's a bracing reminder of just how difficult it is to counter momentum once a big-league defense program achieves what aerodynamicists call "escape velocity"  that synergy of speed and gravity that lets a vehicle soar smoothly into the skies. President George W. Bush promised to build a "Star Wars" missile shield, and he has kept that promise  even if there is no guarantee if the shield works or that it increases security. There has indeed been much Democratic derision focused on what has mostly been seen as a Republican program, one that has been lavished with $100 billion since Ronald Reagan called for such a shield at the height of the Cold War in 1983. But even in a Democratic-run Pentagon the push for missile defense is going to continue. If Obama keeps Defense Secretary Robert Gates on, as some advisers are arguing he should, that would come as no surprise. "Russia has nothing to fear from a defensive missile shield," Gates said Thursday as he argued for extending the system to Europe. 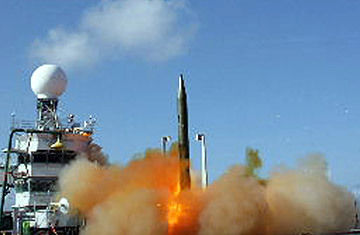 The current plan is to place 10 missile interceptors in Poland and a missile-tracking radar in the Czech Republic by 2014. It's strongly opposed by Russia, which views it as an unwelcome military threat in a region where it has always been pre-eminent. The other leading contender for the Pentagon post is Richard Danzig, a Clinton Navy secretary, who recently told reporters that the Obama team has "a strong view that national missile defense is a rewarding area and should be invested in." The outgoing general who heads the Pentagon's missile defense efforts declared Wednesday that the system is "absolutely" workable. Lieutenant General Henry Obering, who is leaving his post after four years of running the program, said U.S. interests would be "severely hurt" if Obama abandons the Bush Administration's plans to expand the missile shield to Europe. "What we have discovered is that a lot of the folks that have not been in [the Bush] Administration seem to be dated, in terms of the program," Obering said. "They are kind of calibrated back in the 2000 time frame and we have come a hell of a long way since 2000." Beyond the endorsements of the military and possible defense secretaries, recent post-election statements from Moscow criticizing the European expansion of the missile shield make it highly likely it will happen, U.S. officials say. Obama can't be seen, early in his tenure, as bending to Russia's wishes, they say. While all that suggests the system will move full speed ahead, there was a recent ground-breaking that makes it pretty much official. Three weeks ago, the Pentagon began work on a new missile defense "Headquarters Command Center" at Fort Belvoir, Virginia, about 10 miles south of the Pentagon. The $38.5 million building will be home to 300 Missile Defense Agency workers. Its planned brick veneer will match the fort's Georgian Colonial Revival style. Once finished in late 2010, the brand new missile-defense headquarters will blend in with Fort Belvoir's pre-World War II buildings. It will seem like it has always been there.